The global digital revolution continues to change our lives, blurring the boundaries between online and offline and asking us to reconsider the very nature of reality. Associate Dean of Libraries, Digital Initiatives and Automated Services Kenneth R. Herold, M.L.I.S., is giving Adelphi a seat at the table for this important conversation. Herold studies how humans share and absorb information in an emerging field called the philosophy of information. 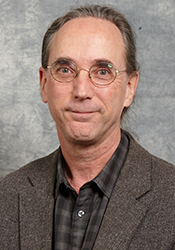 His research combines computer science, information science, information technology and philosophy to analyze the use, nature and application of information. Herold’s work has significant ethical implications. The philosophy of information strives to understand the role of libraries and their curation of information in the digital age, and suggests that digital informatics can actually help in the fight against poverty, destruction and the waste of natural and human resources. » Learn more about Herold’s work. June 28, 2016 A Year in Review News A look at the many ways Adelphi made news and was recognized for excellence in 2015–2016.